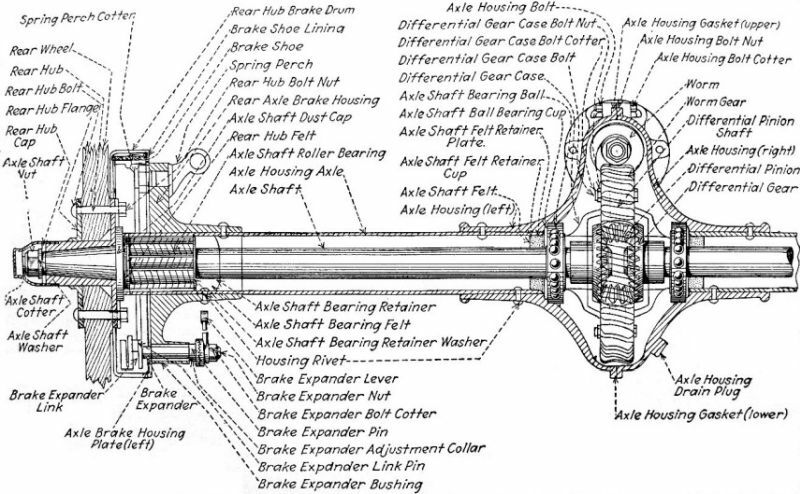 Model T Ford Forum: Differential Pinion Gear? Model T Ford Forum: Forum 2018: Differential Pinion Gear? I came into a lot of T parts recently, and I need help identifying some of them. 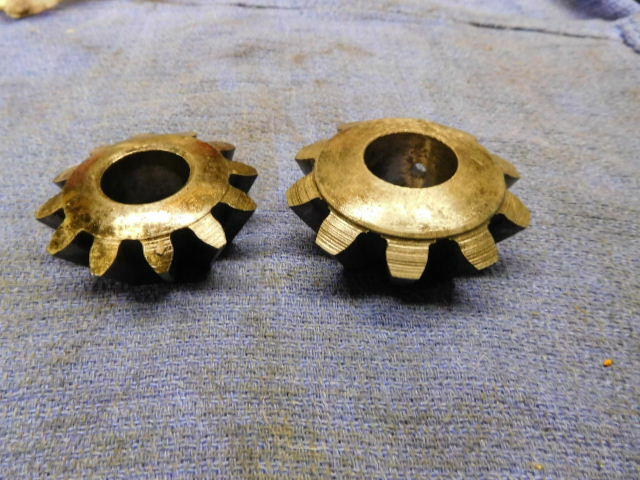 One is very similar to the "differential pinion gear" but larger and with fewer teeth. The normal car part has 12 teeth, and the mystery part has 10. I'm wondering whether it's for a TT truck. Car part on the left, other one on the right. Thanks for any help. Not pinion gears, they are the planetary gears inside the diff casing. One could be model A??? I should post on what you call them in the USA, spider gears. TT rear axle was worm gear drive. Possibly a TT differential pinion ? 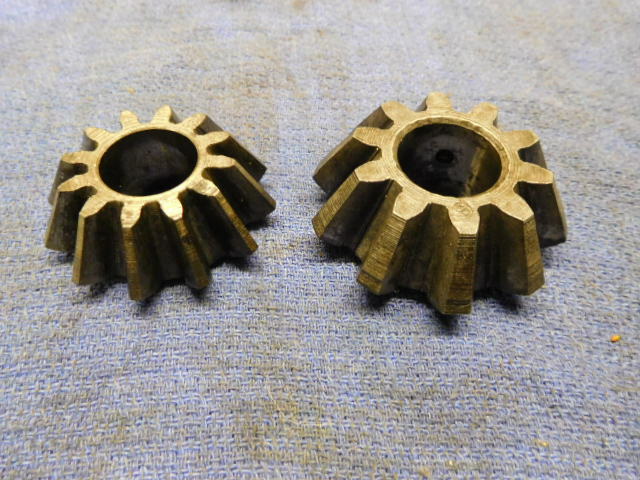 Model A and T had the same spider gears except for around 1930 when an oil hole was added, but still the same size as T.
An apology is owed, should always check, the original Ford parts books cars and TT's, do call the spider gear a pinion gear. But I think modern terminology gives less confusion! Not always Frank! I never will get used to the Ford parts books that use the term "pushrod" for what I've always called the tappets or valve lifters. Here in the U.S., all overhead valve engines use what we call "pushrods", which of course is a long, thin rod about the size and shape of a wooden pencil; the pushrod which is actuated by the "tappet" or valve lifter on one end, and actuates the rocker arms at the opposite end on an overhead valve engine. What most of us "Yanks" think of as a "pushrod" is an entirely different part than what the Ford parts books call a pushrod! I'm with you Frank. If they are pinion gears, what do you call the gear on the end of the driveshaft??? Harold, we are almost on the same page as you on pushrods, those long thin rods between the rockers and the cam followers on OHV engines. Then we differ a bit. The thing which rides on the cam is called a cam follower or valve lifter. At the other end are the rockers, and on the ends of these are the adjustable thingoes called tappets. So a T has cam followers. They do not have tappets, unless adjustable cam followers have been fitted. And of course there are no push rods. It makes me wonder how we ever get these things to work!!!! I've always heard these parts called "spider gears" or "planetary gears" but I looked in Lang's catalog to find what they should be called. They call them "differential pinion gears." I didn't have a Ford parts book handy; probably should have dug one up to be official. I know what we normally call pinion gears. Anyway, you guys now know what I'm asking about. Maybe it's a Model A part; I don't know anything about those "modern" cars. Any Model A guys recognize these? And I know that TT's have worms with their ring gears, but don't they also have spider gears? The ford parts book calls it a differential pinion, and the part that holds it is the differential spider.